Singapore Math’s kindergarten worksheet, asking kids to add and subtract with a number line. 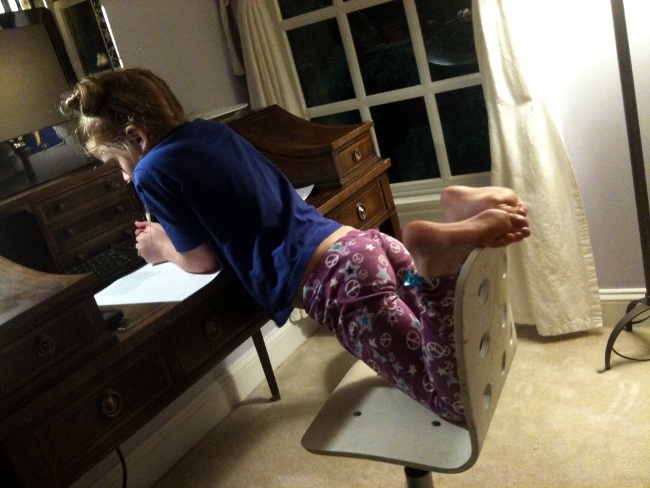 If there is one homeschool subject that seems to strike fear in parents’ hearts, it is math. Fortunately, if you start with the younger grades, kindergarten math is a great way to build confidence. Can you count? Can you do simple addition and subtraction? Wow! Great! You can teach kindergarten math! First grade math is similarly simple. Things start to heat up in the second grade, however, and by third grade, you will find that your own math skills start to get tested. Whatever anxieties math may raise in all of us, I got an important lesson recently in how vitally important math is for preparing a student for the business world. I was chatting with someone recently who is probably the most entrepreneurial minded person I have ever met. He earned his living buying and selling small businesses and spoke of running up to 8 business at one time as though it was nothing special. I asked him a few questions about how he learned these business skills and the first thing that came to mind was that he loved math as a kid. He completed high school math while still in elementary school. Hearing this made me think differently about the best businesspeople I have met. It seems true that good businesspeople think in numbers. They readily translate complex situations into numbers and start running calculations (even subconsciously) on how to achieve a desired result. So, when we talk about wanting to develop a nation of entrepreneurs, what we might really be saying is that we need all children to be better at math than ever before. 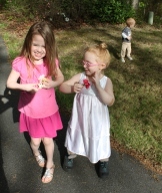 When I first started teaching math to my eldest daughter, we were using a prepackaged kindergarten math curriculum. We had to complete a certain number of lessons and pages every day. The math curriculum we used was thorough but repetitive. My daughter generally did well in math as a kindergartner and she didn’t need to practice counting out 10 or 20 objects for 5 worksheets in a row. It was hard to hold her attention with this curriculum. When first grade rolled around, the math curriculum was one of the first things I knew we wanted to change. I went looking for recommendations by visiting the websites for some of the best private schools in Washington, D.C. I wanted to know what curriculum those schools were using. It was during this research that I learned about Singapore Math. Singapore Math is a math curriculum that, not surprisingly, originates from Singapore. It was developed by a group of educators to serve as a sort of national curriculum for Singapore schools. The curriculum has since been imported to the United States (because English is one of the national languages of Singapore) and has been modified to fit U.S. educational guidelines, especially for the State of California. There is even a version of the curriculum specifically for homeschooling parents. There are still a few Singapore-isms in the U.S. versions, however. The pictures used in the lower grade curricula of unusual fruits and toys have led to funny conversations with my daughters questioning “What is that thing?” Some of the international names in the story problems are giving us an education in diversity as well. Singapore Math’s mind-stretching fraction exercises for second grade. Questions about time ask not only what time it is but also how much time has passed and cover time shifts from a.m. to p.m. In kindergarten, students start dividing numbers into tens and ones and write numbers up to 40. Money questions involve rarely used coins like the 50 cent piece. Units on measurement and capacity require students to learn the metric system of meters, centimeters and kilograms in addition to the U.S. system of feet, inches and pounds. 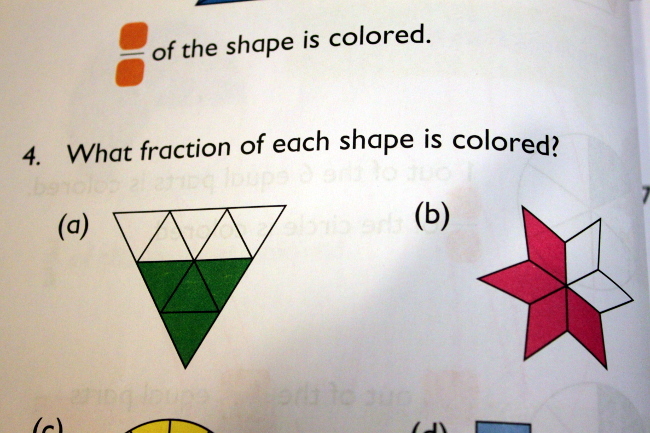 Based on what I learned as a child, these math standards are far more challenging. What made the second grade Singapore Math curriculum different in this regard, however, was that it emphasized mental math strategies. For example, if you are adding 199 to a number, it tells you that you can think of adding 200 and subtracting 1 from the other number. My husband naturally thinks in math this way. He describes it as “floating memory” math because you need to be able to hold several numbers in memory before you calculate the final answer. One of many mental math strategies taught in Singapore Math. I never learned mental math strategies. I do everything on paper, calculator or computer, following a memorized process. So, as I am teaching my daughter, I am actually teaching myself! If you don’t naturally think this way, it is challenging to learn these mental math strategies. Observing my daughter, I have seen that she might have an initial understanding of the mental math concept and can execute the assignment for the day but then later on when she an easy opportunity to use a mental strategy, she often won’t use it and instead will use the paper method. But sometimes she will sneak in a mental math strategy and it is exciting to see her start to see the bigger picture in math. Using Singapore Math requires that you buy in to the theory of the program and commit to teaching even through the hard spots. The typical flow of the program for us tends to be that you have a few units that are easy and flow smoothly and then you hit a really tough unit. I remember in first grade being astounded that we were basically being asked to teach all of the pluses from 1+1 to 9+9 in just a few weeks. I began to question my choice of curriculum and thought this was perhaps too ambitious. We struggled through the unit, held our breath, turned the page and found that the next units reviewed and practiced the pluses in different ways to reinforce the concept and let us relax a bit. Since we already had done the hard work of learning the pluses, the next lessons went much more smoothly. If you have a math genius on your hands, you can emphasize more of the memorization and quick recall of all these math facts. For us, we focused more on learning the process of how you solve these problems rather than memorization and quick recall. 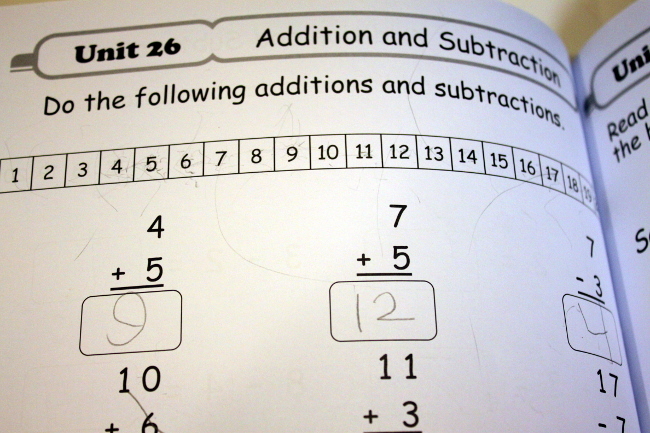 The Singapore Math curriculum has worked for us, but it isn’t always easy. The main downside is that if you do every page and every problem (like we do), it is very hard to complete the curriculum in one year. There is a Part A and a Part B for each year. Toward the end of the year, we sometimes have to cram in extra work on weekends to get it finished and we haven’t yet finished the full year curriculum in the given school year. We always drag a bit of Part B into the fall. For example, the second grade curriculum is 633 pages with multiple questions per page. While that works out to about 3.5 pages per day in a public school 180 day school year, in practice, that is a LOT of pages to get through. You can’t always plow through the harder units at the same pace as the easier ones. Sometimes 2 pages of review questions take two hours to get through. Based on my informal comparison of public school math objectives to the Singapore Math curriculum, the public school system typically covers about half of what Singapore Math covers in a year, which is a much more realistic objective. 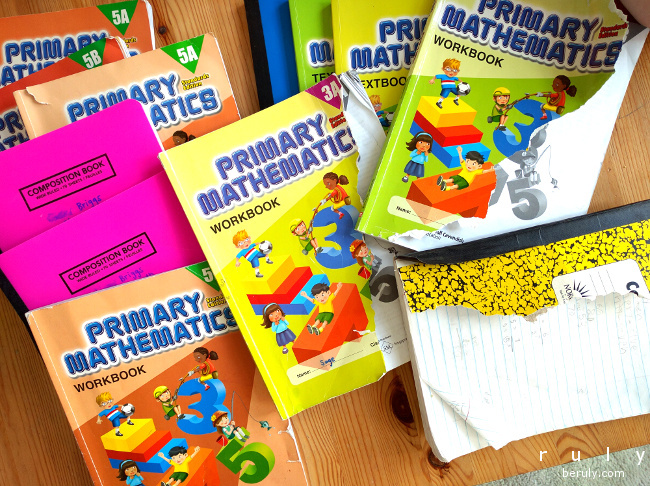 So, while we stick by Singapore Math because of the creative underlying approach and its high standards, I have met a lot of homeschool parents who found it just too stressful. Perhaps as we head into the upper grades and the math gets harder and harder, we might feel the same. But if we can stick with it, I feel confident that my children will have excellent math skills by any measure. How do you feel about math? Do you think these heightened standards are appropriate for children today? *I have no affiliation with Singapore Math.